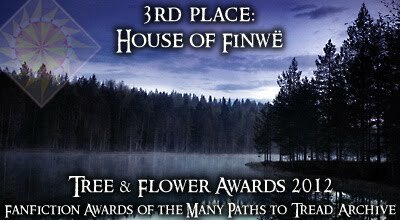 Tree and Flower Awards - Thank You! 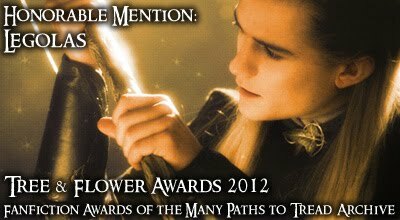 I am sending out a huge "Thank You" to the organizers of the 2012 Tree and Flower Awards held on MPTT. 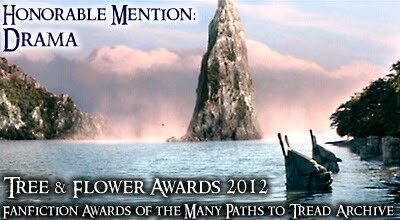 I was thrilled to have several stories of mine win either Third Place or Honorable Mention and doubly thrilled to have my artwork "And Maedhros Stood Aside" awarded First Place! Here are the stories and links to where everything can be read or viewed on MPTT for those of my friends who may be interested. HUGE THANKS go out to all of the organizers of the MPTT Tree and Flower Awards who have worked so very hard behind the scenes to make this possible. I am absolutely thrilled and humbled to have been nominated in the first place and to have actually won for some of my work. To those who voted for me and for the other winners, thank you for taking the time to do so. Recognition by peers is always a joy! Current Location: Thinking about work ahead. Thank you so much (and thank Pippin too, I can hear her little tail thumping from all the way up here - LOL).